Many bloggers have discussed the difference of “data”, “information”, and “knowledge”. Here is my attempt. (1) To become knowledge, information must be linked into a context. See the red arrow (1) that moves the assertion shown in blue as a dashed line between two little squares into a red one. This is where “managing” mere information can become knowledge management. (2) If a simple assertion is extracted from its context it morphs to information again. (3) If a statement is extracted from a more complex context (symbolized as the red dash-dotted line connecting two substructures), this requires “knowing” (red arrow 3), although the extracted statement may become a simple contextless information artefact (blue). 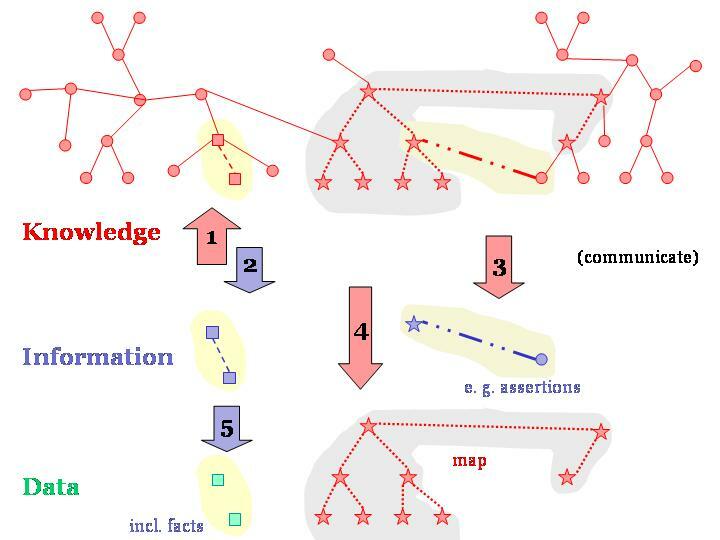 (4) If an entire structure of complex connections and relationships succeeds to be communicated (symbolized by the concept map consisting of litte stars and dotted lines), also the newly constructed artefact or mental map can be called knowledge (red). (5) Many confusions are possible due to diverging usage of some terms in special circumstances. If simple data like, say, meaningless numbers (green below arrow 5) are drawn from a constant location like a row in a periodically published table, these facts are also called “data” but are information. Normally, however, data is the raw material for information (that was, for instance, completely meaningless to us “data processing” people who had to store and transport our users’ data when IT was not yet called IT). This entry was posted in Knowledge management. Bookmark the permalink.